A blast valve is used to protect a shelter, such as a fallout shelter or bunker, from the effects of sudden outside air pressure changes. A nuclear weapon creates a shock wave, which may produce sudden pressure changes of more than an atmosphere (about 15 pounds per square inch) even several miles or kilometers from the detonation point. After the shock wave passes, a sudden negative pressure follows. If such pressure waves enter a shelter, they will likely do substantial harm to occupants and equipment. 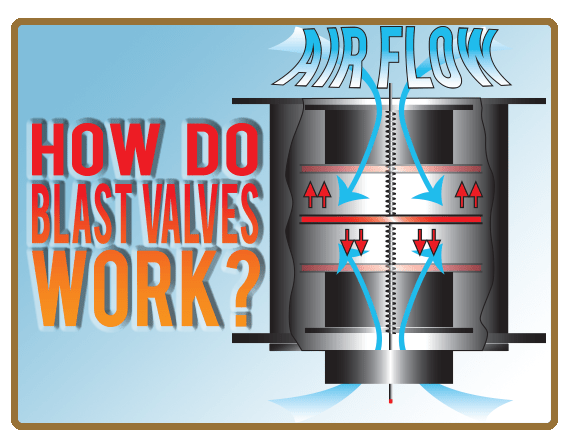 A blast valve is placed in air intake/exhaust pipes. In normal conditions the blast valves remain open, but the spring loaded valves automatically close when strong pressure is applied in either direction. Our blast valve has an entry diameter of 6 with a larger center section. Within the center section is a disk mounted on an axle, with weak springs that keep it centered, away from both entries. Pressure displaces the disk along the axle, until it plugs one entry or the other. After the blast, the springs return the disk to the center, re-opening the valve. LEARN MORE ABOUT ACTIVATED TEDA CARBON HERE. LEARN MORE ABOUT HEAP AND ULPA FILTERS HERE.